A canceled game from 2005 may not be dead after all. Killing Day never made an enormous splash on the gaming scene. Aside from one trailer at E3 2005 and a subsequent announcement that the title was no longer in development, this stylized first-person shooter surfaced and disappeared quietly. A new trademark filing suggests that the game may not be down for the count just yet, though. Ubisoft wants to own the Killing Day brand, which means it may still have plans for the fledgling IP. The trademark application itself is fairly straightforward. 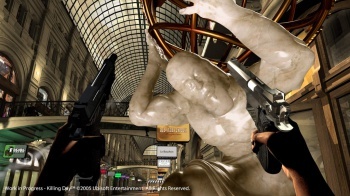 Signed by Ubisoft CEO Yves Guillemot, the application requests rights to the Killing Day name for "game software and electronic game programs." While an application for a trademark is hardly a commitment to delivering a final product, it makes little sense if Ubisoft has absolutely no plans to revive Killing Day at some point within the next few years. The videogame market is not exactly hurting for action games about tattooed gangsters who dual-wield pistols in destructible environments, but there's still plenty of room for a new IP, provided it's done well. Just keep your expectations realistic; canceled games don't always come back in top shape.